Play our free multiplayer online blackjack game with no download or registration. 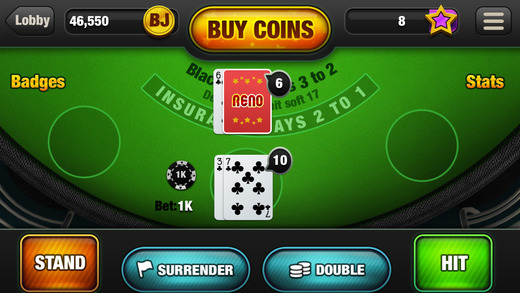 Start playing blackjack by clicking on the Reno table and clicking bet. Chat with other players by clicking on the chat bubble in the lower left. You can also invite friends by clicking on an empty hand. Press here to play blackjack! Ready for real money Blackjack? You can play live dealer blackjack! PLAY REAL MONEY BLACKJACK AT BET365! Multiplayer Blackjack – Play our free online blackjack games with others, just join a table and you will be connected to a multiplayer blackjack table. You can invite friends to play by clicking on an empty seat and you will be given the choice to copy a link or share via twitter, facebook or email. If you would like to play single player blackjack, go into settings (top right button) and click multiplayer off. Card Count – We don’t re-shuffle after each hand, instead we use virtual decks allowing players to card count. Reno & Philadelphia deal eight decks. San Diego and Denver are six decks. Chicago and New Orleans are two decks. Our final two tables: Atlantic City and Las Vegas offer single-deck blackjack. The house edge for blackjack drops as decks are removed from the game. Las Vegas Blackjack Rules – Our 21 blackjack game offers the same rules found in Las Vegas and other casinos around the world. Blackjack pays 3-2. Players can double down on any two cards. Double down after splitting is permitted. Surrender is available. Blackjack dealer hits soft 17. 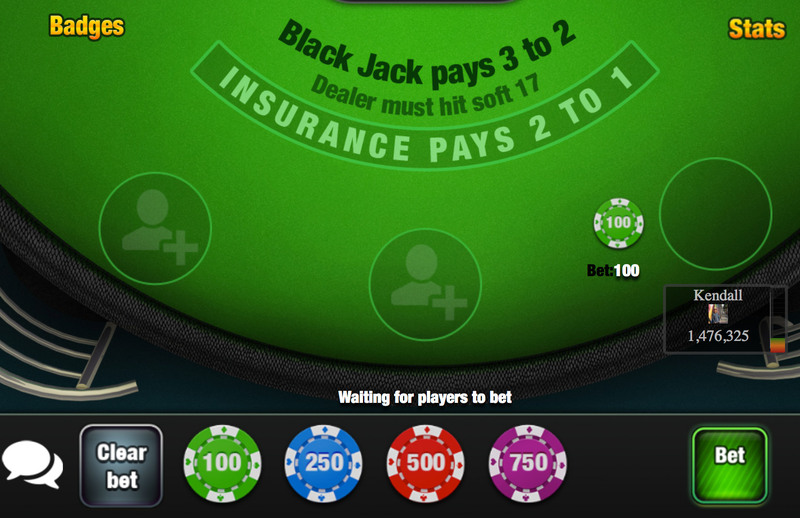 Blackjack app & mobile blackjack – You can download our free blackjack app on iOS and Android. You can also play our mobile blackjack game directly through your mobile browser (no download needed) and we have optimized our game to fit your mobile screen in landscape mode. 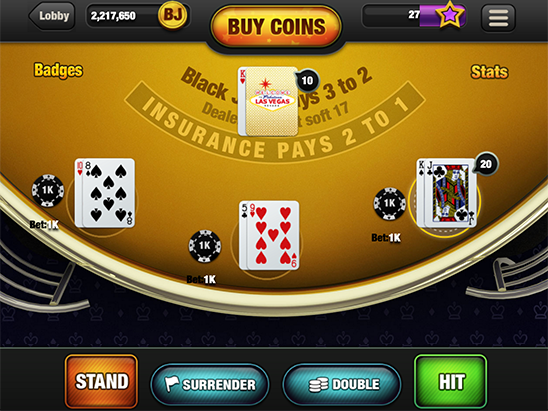 To start a hand on the Free Blackjack App, click on an unlocked city. All players start at Reno. Next, click on the chip denominations at the bottom of the table. Once the desired bet is displayed, click the bet button to the right. Two cards are then dealt to the player(s) and dealer. The dealer will only show one of his cards. If the dealer’s door card is an ace, it will ask if the player would like insurance. Insurance pays 2-1 if the dealer has a blackjack. The dealer will then peak to see if he has a blackjack. The dealer will also peak with a ten-value card showing, but will not offer insurance. If the dealer has blackjack, the hand is over. The player will push with blackjack and all other hands lose. Hit – A player that hits is taking a card in an attempt to improve the hand. A player may hit cards one at a time until the hand busts. Stand – A player that is satisfied with the hand’s point value stands. This means that no cards are drawn. Split – Split is available when a pair is dealt. To split, a player must make an equal-sized bet to the original wager. If another pair is drawn, the hand may be resplit, except for aces. A max three split hands are allowed. The Free Blackjack App does not allow splitting ten-value cards that do not pair. Players may double down after splitting. Double Down – A player that would like to double his bet and receive just one card may double down. Once this action is taken, there are no more moves for a player. The card must be kept and the double bet must remain on the table. Surrender – A player that does not like the start hand in relation to the dealer’s up card may surrender. This is where a player gives the dealer half the original wager and folds.